This is one of the most requested collections we've done in years. 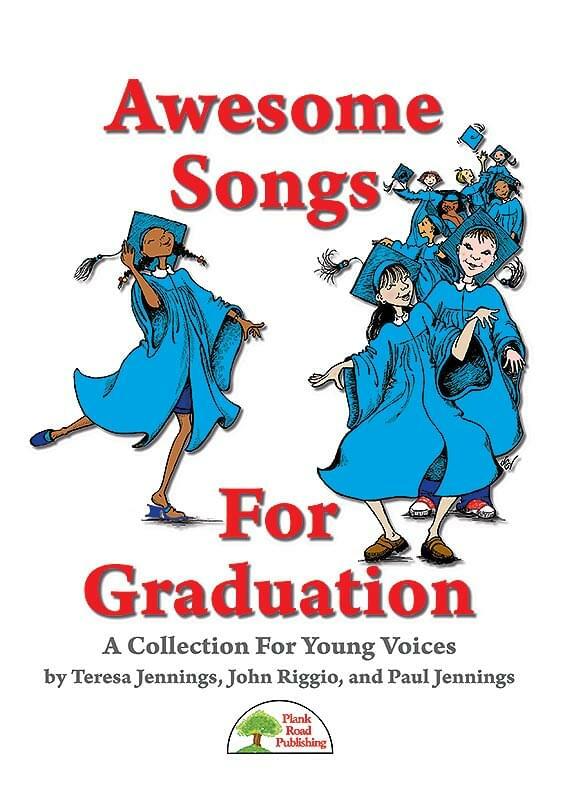 There are many opportunities within the K-8 years for graduation and commencement ceremonies, and throughout our history we have created a wide spectrum of songs to help teachers add music for their young singers to perform on these occasions. While these eight tunes are in a wide variety of styles, each of them reinforces the positive, motivational ideas that you want in students' minds as they look toward the future and the challenges that will fill it. Go Be Awesome - This short, punchy, driving piece is more like a cheer than a song. As with cheers, its message is motivational and inspirational. Though it's perfect for those year-end ceremonies like graduation or just plain "moving on," it could be used any time. Ready To Go! - This song has an optimistic feel to it – the kind that comes with facing a bright future full of endless possibilities. The song is pretty easy and it's completely in unison with a good bit of repetition. Graduate - This song is a combination of jazz and hip hop. Written as a two-part, with the lower voices in the bass clef, this song should be a comfortable range for your lower, changing, or changed voices. It can also be sung an octave higher if you have no lower voices, essentially making the song unison, which would work perfectly well. Watch As We Walk On Our Way - With positive, motivational ideas, the lyrics of this song aren't particularly challenging, so you could perform the piece with almost any class level. It does break into two parts, but it is just a simple call and response, so it should be easily learned. The Future's Calling Us - This song talks about accomplishments which are always a good thing to celebrate. This tune derives its pulse from a good old-fashioned rock rhythm section and an alto sax that alternates between the melody and a wailing solo line. It's Our Time - This is a very positive, forward-looking tune that lends itself nicely to any graduation or promotion ceremony. Never Stop Learning - The message is simple: We should always keep learning, no matter how old we are. The song begins with just piano and solos, and as with most anthem rock songs, there is a constant building going on from beginning to end. Onward! - This very exciting, energetic, and majestic piece has just the right lift and passion to help you and your students project a positive, motivational spirit. Consider using it in a processional manner and having students enter, walking or even marching to the beat.